You may be familiar with various styles of paper cutting. Many cultures throughout history have perfected this artform in their own unique styles. You may be familiar with cut letters, too. Julian Waters often has his students write in heavy, tightly spaced blackletter in order to cut out an entire quotation as one piece. Carl Rohrs has perfected a style of layering of cut letterforms utilizing scrumptious decorative papers. Julie Gray is well noted for her cut paper ‘paintings’ as well as her unique cut letters. Having had workshops with Julian and Carl and playing with various techniques on my own, I find myself returning to cut letter(s) as a fun way to explore counterspaces and spacing and rediscovering letterforms. In this mini-workshop, we will be cutting out a single work (or name if you prefer) in white and black paper. I will show you how to ‘beef up’ your preferred style of writing in order to create an interesting composition and eliminate having to cut out very delicate, thin forms (that would be a project for another day!). Once a word is cut, attendees will decide which decorative paper will fill the counterspaces of their word. This is the thrilling part – placing your word on top of various papers and watching those counterspaces come to life! ONE Zig or other large (5mm) calligraphy marker or ONE Tombow/other brush marker. Large parallel pen will work – but we are going for a short drying time – so simple chiseled markers will be just fine! We will be ‘sprucing up’ letters with a pencil so perfect edges are not essential – as a matter of fact, they might make things more interesting! Color of marker does not matter. Double pencil (2 pencils taped or banded together to create a large ‘nib’) Note: If your specialty is pointed pen writing, bring the double pencil. Decorative paper – anything you like! Note: All paper can be small (letter size is plenty big) and should be about weight of card stock – not too thin, not too thick. Sally has been a lover of letters since she first learned to print in grade school. To this day she is inspired by the calligraphic line, moved by the rhythm of letter and word spacing and in awe of the texture they all create. Sally has created meticulous work utilizing traditional tools such as vellum, tempura, gold, stick ink, and quills. She also experiments with abstract forms using a variety of modern and traditional materials. Her lettering can be found painted on fabric, washed onto paper, glazed onto ceramic, etched into glass, or cut from paper. Currently she is experimenting with creating hand-made books to house her calligraphy. She also creates invitations, envelopes and place cards for weddings and other special events. 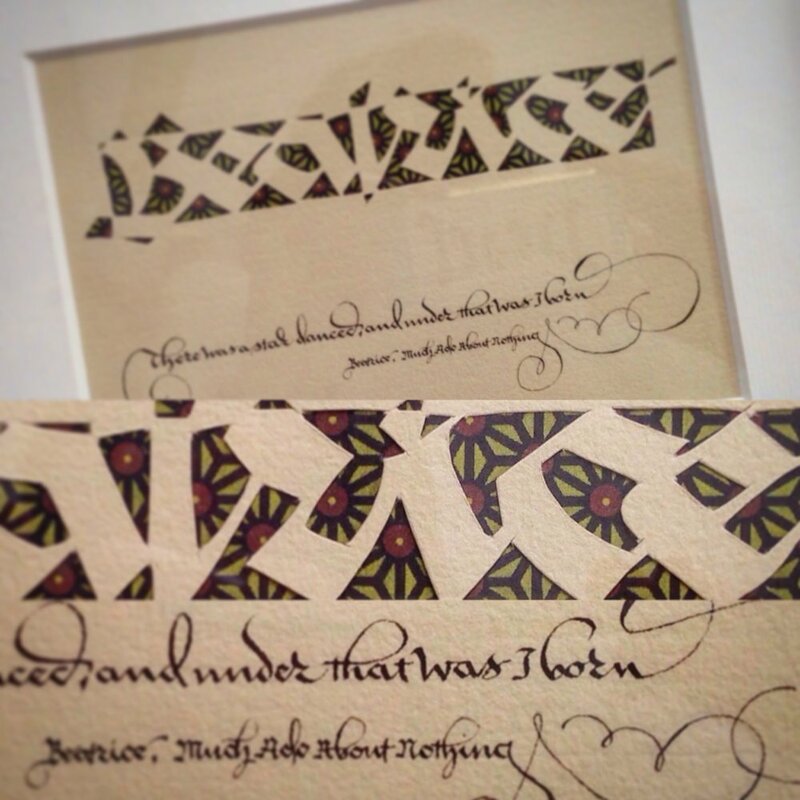 Sally considers herself fortunate to have enhanced her artistry and skills as a student in workshops of noted calligraphers Sheila Waters, Myrna Rosen, Carl Rohrs, Reggie Ezell, Laurie Doctor, Pamela Paulsrud, Julian Waters, Thomas Ingmire, Judy Melvin, Peter Thornton, and John Stevens, among others. Prior to moving to Minnesota in 2017, Sally was a long-time member and past president of the Calligraphy Guild of Pittsburgh. She is grateful and excited that she has found the Colleagues!